Hi. 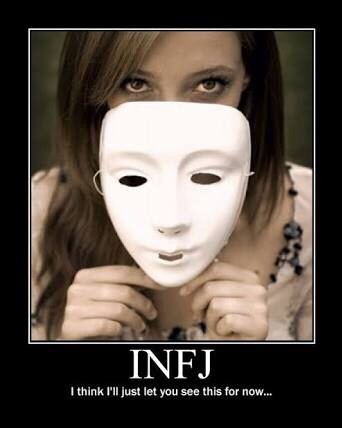 I’m an INFJ… and I’m a mistress of the masquerade. When Halloween comes around, I often feel the greatest costume for an INFJ is to go unmasked. Just for one night, to show the world who she really is. It will never happen of course. We rarely wander without our masks in place. But why do INFJs wear masks? For protection? Subterfuge? Deception? … and put on the new mask. Now this is where the INFJ differs from the other types. Most other types, after deciding you are trustworthy, will throw away their blank mask and let you see their true self. The INFJ, however, will now pluck a new mask from her myriad collection and wear that instead. If you’re an outgoing, jovial joker, the INFJ will don her jester’s mask and become a prankster right along with you. If you’re a quiet, shy, brooder, the INFJ will wear her sombre drama mask and be your Shakespearian companion. Well that depends on you. Only when you’re deemed trustworthy and welcomed into the inner circle will the INFJ remove all of her masks. Don’t fret if that doesn’t happen quickly (or at all); it’s a rare person that gets into the INFJs inner circle. 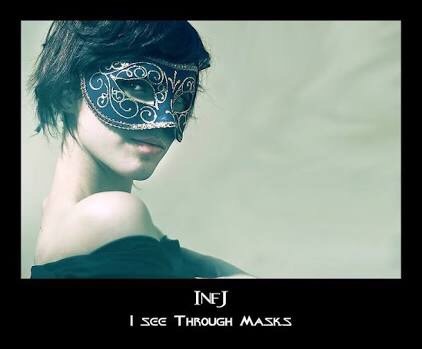 The main reason for this is because the INFJ has become so adept at wearing masks, she can also see beneath them. While you might have worn a friendly, smiling mask when you first met the INFJ, if your mask was hiding a dark heart, the INFJ will have seen through the mask. If your first mask was worn to hide a usurping, back-stabbing personality, the INFJ knows. However, if your mask hid a gentle soul in need of protection, be warned, the INFJ knows and she will make it her life’s mission to protect your soul. 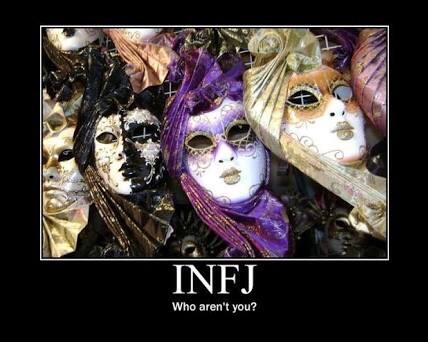 So remember, when you first meet an INFJ, you get one chance to get under her mask, and regardless what Mardi Gras mask you have on when you first meet, she can see beneath to the real you. Posted on July 19, 2017 July 4, 2017 by Jessica BakkersPosted in All about INFJsTagged All about INFJs, blogging, deception, INFJ, Inspiration, intuition, masquerade masks, WordPress. Okay, first, before I forget… I used to collect Venetian Carnivale masks. This post brought back fond memories, just with the photos, because I’ve lost all my masks (except for one small one on a Venetian figurine). Thank you for that. Now, my question. I totally get what you’re saying about the masks worn, but do you think that chameleon-quality of mask-wearing makes INFJs dishonest, or just adaptable and guarded? Interesting question, Staci. Speaking for myself (as an INFJ) I know that I am guarded when meeting new people. I can still be that way, even years after knowing someone, unless I really connect. It’s hard to let down my guard. Looking forward to hearing from Jess. BTW, I love Venetian Carnivale masks too. My husband thinks they’re kind of freaky so I’ve used photos in decorating rather than the actual masks. Why does it not surprise me that you like the masks, too? You’re probably aware that I’m also an INFJ. I use masks often, but I don’t think I’m being dishonest. (At least, I really hope not.) Just careful. I guess I just want Jess to validate that. I’d feel terrible about being disingenuous to people, but I don’t know if I could change. It’s hard to let anyone in, especially strangers. I’m in complete agreement, Staci. I don’t feel like I’m being dishonest either….just not open. I think the INFJ is a naturally trusting sort. We take everyone at face value (unless we obviously see through a mask). At the same time, we don’t trust others to see us as we really are. Weird! Or maybe just complex, LOL! No, definitely not dishonesty. I don’t know if we’re capable of open dishonesty! It’s about protecting ourselves and the need to fit in. Maybe not so much dishonest as too keen to please to be our real selves. I slip into the jester/brooder/sophisticate almost without realising it to fit in with whoever I’m with. It’s not really a conscious decision. Whether it comes from a desire to fit in or need to protect my inner layer I’m not totally sure, but it’s not about deceit. I’m glad to hear that. Thanks for the reassurance. You always express the intricacies of the INFJ personality so well. Another spot on post! Jessica, I too am INFJ. I’ve always thought of it not as a mask, but as a guard up to keep from feeling to much of other’s feelings, especially when it is unexpected. I trust my intuition and won’t let the “wall” down little by little until it is clearly safe. Good read!! A wall; that’s quite a good description. Less about deceiving and more about protection. Nice. I love Venetian masks, and the whole concept of masks, of “becoming someone else”…I wonder if that’s part of the appeal of stories and storytelling. It’s such an intimate thing, to experience a story from the point of view of the characters. I definitely see myself in this post, though I’m not sure if I agree with the label of masks. I think there is a part of me that can be a joker/fool, and part of me can be a stoic, or a kind heart, and while they may not be all that I am, I think they are part of me. So in a way I am showing people who I am, just…the parts that I think they’re ready to see, or the parts that I think they’re looking for, even if they don’t know it. There’s definitely a way in which most people are not in the market for every facet, and, typical INFJ, I don’t impose that on them. Though I also agree with Jeff Rab that there’s also an element of self-protection. Sometimes, just by knowing things about me, people can more easily hurt me, without meaning to, so there are definitely some things that I am cautious about. Interestingly, I recently had a conversation with someone where we talked about how the closest friends are those who’ve seen “me” crumble, who’ve seen me in a time where I don’t have the energy or concentration to control. They see the bad parts, and they don’t shy away, they embrace, and come back. There’s definitely a strength to knowing that someone has seen you at the worst, and honestly decided it’s not that bad. After that, there’s nothing left to worry about, in regards to that connection. I also can’t help but think of that old saying about how the masks we wear gradually become who we are, and while that’s often been expressed as a warning or negative, I’ve known a few who have essentially said “Pretend to be someone who can handle this”, and over time that mask does become true, but in their case it was a good thing. Definitely a very interesting topic. And it’s very reaffirming to meet people who like to delve into such things. Most of those I meet in my daily life prefer to leave such things in the unconscious. I think I’m an infj to the extreme when it comes to masks. I recently opened up to one of my ‘inner circle’ and was knocked down harshly for it. So I’ve decided this is someone else I need to wear the ‘everything’s great and I’m super happy mask’ with. Now there are really only two people left who see me unmasked. Sad but I’m not going through that pain again. I’m sorry. It really is frustrating, and confusing. Who you are doesn’t have a negative impact on others. It can only has a positive or neutral effect, so there really is no reason for that kind of response. But at least you know who you can trust, and hopefully, with time, you’ll find others. It’s a very gradual process, but it’s wonderful when you do. I’m so glad that I stumbled upon your website! This is such a well-written article about INFJ masks. As an INFJ, I can completely relate to this. I’ve always wondered if I was being fake for wearing a different mask on different occasions. Growing up, I’ve come to think that all of the masks are a part of myself. I feel like we have too complex and different a personality that it doesn’t make sense to showcase it in its full glory to everyone and explain ourselves all the time, so we show a partial side of ourselves to others. Rather than calling it as showing a different face to different people, I would say we show different parts of ourselves to different people. At the end of the day, we possess all the masks and display whatever we want based on circumstances. For me–as an almost 56 year old infj male–it’s simple. The “mask” opens the door to other people and grants me instant access, because I make them comfortable, and they can relax and be themselves with me. Because I radiate honesty and sincerity, they trust me and allow me to get on their page or to come into their “room.” How do I accomplish this? I simply knock on the door of their person as a three year old, pure, innocent, trusting, and genuinely curious about the beauty and wonder I see reflected in them (using inferior Se in one of the ways it was meant to be used by an infj.) This means my heart is bare and unprotected (auxiliary Fe at its best,) and though my heart gets stepped on a lot, I am deeply privileged to “see” (dominant Ni) what most people never witness: the incomparable essence of another human being made in the image and likeness of God. If you are an authentic infj, please do not abuse this gift or betray the trust so freely given by others. Life is simply too precious. P.S. Tertiary Ti was used to edit and proof this comment before posting–no spell/grammar check required ☺. Fantastic response Gilbert. You are indeed a true INFJ. Pleased to peek behind your mask for a moment and make your acquaintance. Thank you very much. I have enjoyed reading a number of your posts, and I am equally delighted to get to know you as well. Perhaps time and fortune will permit our paths to cross some day. I wish you much happiness and success.